Kilmainham Gaol provides visitors with a chilling if poignant reminder of the Irish struggle for independence. Feels colder in than out. This despite the shelter from the October wind offered by the refuge of the dull grey stone walls of the jail. Dublin’s Kilmainham Gaol was the most infamous prison in Ireland. Here Ireland’s greatest rebels were imprisoned and many of them executed. Now it is the largest unoccupied jail in Europe and a museum charters the violent transition to Irish independence. For 130 years Kilmainham Gaol operated as a prison (from 1796 when it was built until 1926). The prison has a dark history that is intrinsically linked with struggle. Executions, torture and injustice are forever associated with what is often called the Irish Bastille. For Dubliners, it was the most feared building in the city. The entrance to the jail sets the tone. Public hangings were performed here in the early days. Before you even enter the building you get a hint of its macabre past. The balcony over the front door entrance was used as a gibbet for public hangings. The door with its spyhatch and the Five Devils of Kilmainham - the bronze sculpture of five entwined serpents - mark the threshold to this grim place. Now into the interior of the jail. The Victorian main hall of the prison is a bit of an architectural surprise. Symmetrical in design it seems comparatively spacious and light despite the caged staircases. Good ventilation and light are elements not seen in many previous jail designs and were quite revolutionary at the time. Despite its relative modernity when constructed, the central tenet of constant surveillance was of paramount importance. The hallway may be spacious but the cells themselves are small, cramped and spartan. They are pretty much presented as they would have been when last used so you can get a flavour of what it was like to be a prisoner, especially if you ask the guide to lock you temporarily in one of the cells. This part of the prison may seem familiar to some, as it has featured in scenes in the movies. Some of In the Name of the Father, Michael Collins and The Italian Job were shot here. Kilmainham is most famously associated with the imprisonment of Irish rebels who fought for independence, but it was also used as well as a civil prison. Many political prisoners were held along side criminals in the next cells. After the failed rebellion of 1803, Robert Emmet was held here until he was executed. He was taken to Thomas Street (just outside St Catherine’s Church) where he was hanged. Afterward his body was brought back to Kilmainham Gaol and it was guarded there, but then it mysteriously disappeared. Some say he was buried in the Bully’s Acre at the Royal Hospital of Kilmainham in an unmarked grave, but others maintain his body was taken away and dumped somewhere to take away from his heroic reputation. If this was the case, it didn’t work as many fighters for Irish freedom were inspired by Emmet. The jail was particularly crowded during the potato famine of the 1840s. Many civilians committed petty crimes so they would be convicted and imprisoned. Incarceration was the only sure way to get regular food. At this time, it was also used as a holding area for deportations to the colonies. Severe overcrowding was common with up to 9,000 prisoners held in only 400 cells. In 1881, Charles Stewart Parnell, ‘the uncrowned King of Ireland’, was kept here for six months because of his activities in fomenting violence against unfair landlords during his campaign for land reform. The indomitable Parnell continued to campaign and conduct his affairs while in prison. Two years after Parnell’s prison stay, five men were hanged in Kilmainham. These were the so called Invincibles who had committed the Phoenix Park murders. They assassinated Lord Frederick Cavendish, British Secretary for Ireland and his undersecretary Thomas Henry Burke. The Invincibles were executed in one of the prison yards under tight security. Later Parnell was falsely implicated in these murders by a series of articles in the English Times newspaper and a forged letter allegedly from him ordering the assassinations. Parnell survived these allegations only to be later embroiled in the scandal of an extramarital affair that destroyed his career. The next significant prisoners in Kilmainham Gaol were the leaders of the failed 1916 Easter Rising. Part of the tour of the gaol takes you round the cells where these men were held. Fourteen of them were executed. The small chapel upstairs is painted skyblue. It was the setting for the sombre marriage of Joseph Mary Plunkett and Grace Gifford on the night of May 3 1916. The two exchanged vows during a quiet candlelit ceremony at 11pm. Before 4am the next morning he was shot in the Stonebreakers yard. The executions weren’t over after 1916. Perhaps the shame of what followed has blighted Kilmainham the most. In November 1922, four young Dublin boys were shot by firing squad. It was a political and vengeful killing of Irish men by Irish men, albeit under duress from a British government that wanted vengeance against Erskine Childers. Childers was an opponent of the treaty with the British that divided Ireland. To appease the British, the four anti-treaty Dubliners were executed even though their only crime was to be in possession of firearms. Later Childers was also executed. Eamonn DeValera was the last prisoner in Kilmainham Gaol. He had been one of the leaders during the Easter Rising but was not executed because he was an American citizen. Imprisoned again during the Civil War, he was released on 16 July 1924. He later went on to be President of Ireland and leader of the Fianna Fail party. After the Civil War, Kilmainham became a symbol of Irish disunity and fell into disuse until the 1960s when it was renovated by a team of volunteers. Eamonn DeValera, then the president of Ireland, reopened the prison as a museum on the 50th anniversary of the Rising. 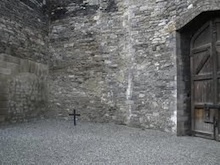 In the West Wing of the old Kilmainham jail, there is a claustrophobic corridor of holding cells where prisoners were kept before they were executed. It is a place of death. And it is filled with the ghosts of the past and unsettled spirits of men who died before they reached their prime. Here the fourteen men executed after the Easter Rising waited for death. It is their fate that resonates most with visitors to Kilmainham Gaol. Their executions took place in May at a quarter to four in the morning. It was barely light. A white cross was placed over their heart to mark the spot for the marksmen. Some of the executioner’s were given blanks so they wouldn’t know who it was who delivered the fatal shot. Padraig Pearce the commander and chief was the first to die, then Tom Clarke, then Thomas McDonagh. The next morning it was the turn of Joseph Plunkett (who had just been married), Edward Daly, Michael O’Hanrahan and William Pearce (Padraig Pearse’s brother). On May 5th it was the turn of John McBride. Then on May 8th it was Con Colbert, Eamon Ceannt, Michael Mallon and Sean Heuston. On May 12th, Sean McDermott and James Connolly the Scottish revolutionary were the last two to be executed. The experience of a visit to Kilmainham is sombre. Especially you feel it in the final scene. There is a poignant silence in the stonebreaker’s yard where the 1916 rebels were shot. Two small crosses mark the spot. The first cross is sited where 13 of them were shot. The second marks the spot where Scot James Connolly died. Segregated not because of his nationality or beliefs but rather because he was too weak from his gangrened wounds to take his last walk across the courtyard. He had to be taken on a stretcher there from the hospital as he had been wounded during the Rising. His assassins took pity on him and strapped him to a chair so he could be shot. They were just doing their job and he bore them no malice.